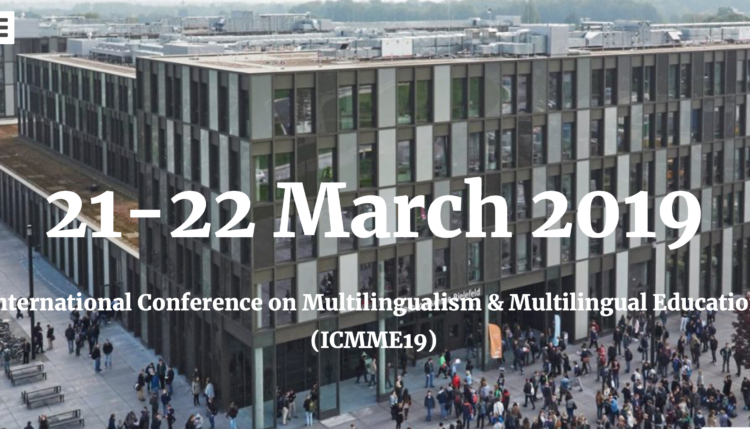 On 21 and 22rd of March 2019, the International Conference on Multilinguism and Multilingual Education (ICMME19) is going to be held in Bielefeld (Germany). According to the Call for Papers, all aspects of the linguistic and sociolinguistic competences and practices of bi-/multilingual speakers are going to be dealt with as long as they cross existing social and linguistic boundaries, adopting or adapting themselves to new and overlapping linguistic spaces. The Call reaches out to a variety of areas of research in bi-/multilingualism in different disciplines, including, but not limited to, linguistics, sociolinguistics, psycholinguistics, neurolinguistics, clinical linguistics, education, bi-/multilingual societies. The topics announced by the conference website will include: (multiple) language acquisition and learning (L3, L4, Lx); psycho- and neurolinguistics of multilingualism; translanguaging; early bilingualism and heritage language development; speech processing in bi-/multilinguals; trans/multilingual language use in different contexts; multilingual education; bi-/multiculturalism; bi-/multilingual language policies; literacy in multiple languages (pluriliteracy); intercultural and globalisation issues related to multilingualism; multilingualism in business/economics; multilingualism and digital media; multilingualism in literature and translation.